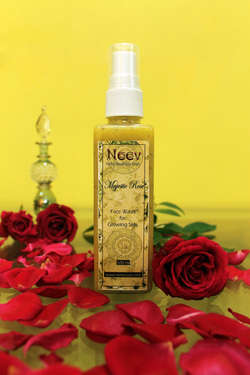 Benefits: Neem Oil controls various skin infections; Olive Oil works as a cleanser, moisturiser and protector of the skin and helps restore skin elasticity. 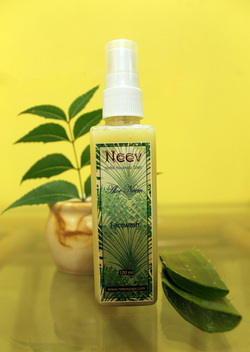 Aloe Vera is moisturising, soothing and healing, helps with sunburn; Tulsi oil and cedarwood oil help in curing acne, pimples and prevents skin diseases, Nagarmotha oil helps in curing skin disorders. Ingredients: Olive Oil, Neem Oil, Lye, Tween 80, Purified Water, Pure Essential Oils of Tulsi, Nagarmotha, Cedarwood and Geranium. Benefits: Rose Oil tones the skin, Olive Oil works as a cleanser, moisturiser and protector of the skin and helps restore skin elasticity. 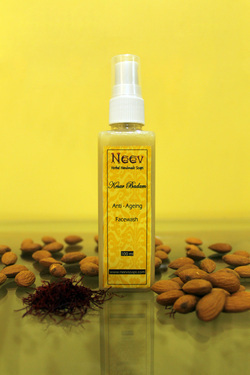 Ingredients: Olive Oil, Rose Petals, Lye, Tween 80, Purified Water, Pure Essential Oils of Rose, Palmarosa and Geranium. Ingredients: Sesame Oil infused with the dried herbs of nagkesar, kumud, anantmool, Sweet Almond Oil, Wheat Germ Oil, Saffron, Lye, Tween 80, Purified Water, Pure Essential Oils of Sandalwood, Vetiver, and Cedarwood.